On Friday 5 November eleven race cars were packed into two 40′ containers bound for the Tasman Revival Series at Eastern Creek, Sydney to be held on 26 -28 November. The cars were Jim Barclay’s Gemini Mk3A FJ, Roger Herrick’s Lola Mk2 FJ, Neil Tolich’s Jocko FJ, Nigel Russell’s FMZ FJ, Tony Olissoff’s Emeryson Elfin FJ, Paul Halford’s Autosud FJ, Chris Atkinson’s Lotus 20/22, Ken William’s BBM, Peter Avery’s Brabham BT16, Peter Boels’ Lotus 41C and Stuart Lush’s McRae GM1. 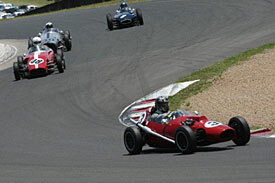 The Tasman Revival Series is held every second year at the undulating and flowing Eastern Creek circuit and this time there were over 400 entries ranging from a 1985 Ferrari 156/85 F1 car to an Austin A30 saloon racer. 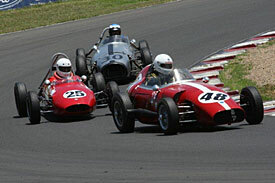 In between there were such gems as a Maserati 250F, Alfa 8C and many other exotics. It is a real spectacle with pit gazing being almost as enjoyable as the racing. After the event organisers had unpacked our container for us, track familarisation commenced on the Thursday with those of us who had not driven the track before getting use to the blind corners, tricky infield and “heart in the mouth” high speed turn one. Friday dawned hot and sunny and it was all action with a official qualifying / practice and a race. As the FJ qualifying time arrived around midday, the temperatures had soured to 36 in the shade and the Kiwi contingent was suffering. Fastest in FJ qualifying was Chris Atkinson in his Lotus 20/22 which showed the benefits of a Richardson head on his Ford engine (these heads are not permitted in NZ FJ racing) by lapping 7 seconds a lap faster the the next best Kiwi FJ car. Tony Olissoff was very quick in the ex Nigel Russell Emeryson Elfin followed by Paul Halford in the Autosud, Nigel Russell in the FMZ, Jim Barclay in the Gemini and Roger Herrick in the Lola. 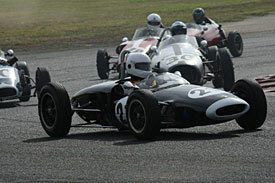 Unfortunately Neil Tolich had unexpected family commitments and was unable to race the Jocko over the weekend – however he did turn up on the Saturday and was able to get two laps in the parade and had the distinction of getting the Jocko to pass the Geogheon Mustang on the main straight (the fact that the Mustang had slowed for a photo shot was not relevant). The first race on Friday was a close affair (apart from Chris’ Lotus which was effectively in another class but nevertheless being well driven and mixing it at the front with the Australian Richardson head cars). Nigel and Tony finished less than half a second apart with Nigel just beating his old car. Paul, Jim and Roger finished line abreast but with a little gap between each car. Paul was going particularly well in the Autosud and it was getting lots of attention in the pits as as front engined Juniors are a rarity in Australia. Roger was frustrated by a mysterious lack of speed in the Lola and was struggling to keep up with the rest of the Kiwis. The Saturday morning race had the Kiwis finishing in a block from 14th to 18th places with the order being Tony, Jim, Paul, Nigel and Roger. The race of the weekend was the Saturday afternoon race with a fantastic full-on dice between Tony, Nigel and Paul. The trio swapped places a number of times every lap and they had the crowd and commentators in raptures. Nigel crossed the line just before Paul with Tony, who had been baulked by a back marker on the last lap, only a second behind. The smile on Paul’s face when he came in took ages to disappear and he reckoned it was one of the best races he had ever driven in. The next day he told us he had woken up at 2am just to go through the race again and he decided not to race on the Sunday as he didn’t want to spoil the high of the Saturday afternoon race. Jim had suffered a sudden loss of power in the Saturday afternoon race and had to be towed in. Back in the pits everything seemed fine but on the Sunday race it happened again with another tow in. The problem remained unresolved as the cars were packed into the container for their trip home but the possible cause could be a fuel line collapse or tank venting issues. Roger’s Lola was getting slower by the race and was lapping over the times set by his Taraschi in 2008. Tony Olissoff and the TAFT mechanics descended on the Lola and after much checking it was found that a rear wheel bearing had almost totally seized and the slow speed of the car was attributable to driving it as if the brakes were on. As it was unable to be fixed at the track it was packed away early into the container. All in all it was a great weekend with a huge variety of exotic cars being raced as they should. The Eastern Creek track is like a longer version of Hampton Downs with a bit more undulation. Pit and function facilities are excellent and the international drivers are housed in a hotel only 5 minutes walk from the track. The Kiwi FJ contingent showed fine camaraderie with after match functions (including Tony’s French aviator impressions) and everyone lending a hand when needed. Unfortunately, the FJ grid ended up splitting itself into two speed groups – those with Richardson or welded up heads and those without. Nevertheless, the racing was close and the revaluations of the meeting for us were the speed of Tony in the Emeryson and Paul’s performance in the Autosud. Roll on 2012.